2 Bedrms, 2 Baths, Private Swim Dock And Covered Boat Slip. Lake And Mt. Views. "Suite Spot" is an awesome cabin with an AMAZING view of Norris Lake. It is conveniently located approx 10 minutes off exit I75, exit 134. It is close to Indian River Marina and Whitman Hollow marina. There is a private covered dock and swim platform. 2 bedrooms, with a full bed in one and full/twin bunk in the other. Property has 600 sq feet of indoor space. The outdoor space consists of a large covered deck and a good-sized open deck with a fire-pit and gas grill. Cabin has a ROKU device with several free apps and access to apps you are subscribed to, like nteflix, amazon prime, hulu, vudu, etc. There is wi-fi, and laundry facilities. "Suite Spot" is a great place for a romantic get-away, or for a small family or group, with beds for up to 5 people. It is comfortable and tastefully decorated. "Suite Spot" is a great place for a true lake vacation! There are approx 110 steps to the water. My love affair with lakes is a direct result from growing up in Minnesota, the land of 10,000 lakes. After moving from Minneapolis to Lexington, KY. in 1984, my husband and I were looking for that perfect lake and we found it here at Norris. We have been enjoying Norris Lake since the year 2000. We rented for several years in various areas and then decided to buy on the north side of the lake by Indian River Marina. We like it on this part of the lake because of its proximity to the interstate and convenient location to stores, etc. Very cool that way! We have worked hard on making our cabins (we have three rentals close by each other) a great place for for friends and families to gather and enjoy all that the lake and surrounding area has to offer! We invite you to check out our other places! We are pet-friendly and people-friendly too! I love sitting on the porch swing. It offers a great view of the lake and it is really fun watching all the boats go by. The moon, when it is visible, is stunning to see. The surrounding woods provide a home to many singing birds. The mountains surrounding the channel have many personalities, sometimes shrouded in fog, sometimes you can hear owls, even coyotes. All in all, "Suite Spot" is sure to please! Million dollar view of Norris Lake! Private covered boat slip. Swim platform. Has double covered boat slip. Private dock. Approx. 100 steps to the water. No land line but cabin has decent cell phone reception. Car port. Room for a couple of cars and a boat trailer. Limited amount of towels provided. Please provide your own towels for the lake. Currently, cabin has a Mr. Coffee type of coffee maker. salt, pepper, additional seasonings and spices. Fully stocked kitchen. Ice maker in the fridge. Stove, oven, microwave, toaster oven. There is a picnic table on the covered deck outside that sits up to six people. Cabin has a ROKU device for access to accounts guests may have like Netflix, Amazon Prime, Hulu, Vudu, etc. Cabin provides Direct tv now and several additional programs for your viewing pleasure. Owner has numerous dvd's avaialble for your viewing pleasure. FREE! Just inquire. Property sits on a large lot, lined with trees on both sides to add privacy. Owner has a tandem and 2 singles available for reservation. Please inquire if interested. Pontoon boat available for reservation. Nearby golf course at Deerfield Resort. Owner has two additional lakefront cabin rentals on the same road. What a great way to be with friends and family, but not 24/7, lol! Total number all three cabins sleep is 16. Just something to think about. We had a great time! The cabin is super clean and has everything you need. We will be back, thank you!! This was such a wonderful spot and view! We came down for a bass tournament that put in at Lonas park boat ramp less that five minute boat ride foe the cabin. The tournament ended up starting at the mouth of Indian River marina which was right where the cabin was, so we were able to start from our dock. Could not have been more perfect. The cabin was wonderful. So clean!! And stocked with everything you could need from kitchen to laundry room. The view is breathtaking and the are was so quite. Joanne was the best to work with ,she was both available and attentive to any and all needs! We will definitely recommend and would love to go back! The place was great! The pontoon was a good option. The cabin was clean and the whole experience was wonderful. My husband and I enjoyed our stay at Suite Spot on Norris Lake. The cabin is just like in the pictures. Perfect for a couple or a small family. The weather was cold (20’s and 30’s degrees) but we were warm in the cabin. Too cold to use,the deck much unless we bundled up. That view was amazing. We enjoyed hiking on trails around the area with our dog. Linda and Joanne were very responsive. Cabin was clean and well stocked. I would recommend it. Really glad you guys enjoyed your visit! Too bad the weather was so cold but that is one thing about East Tennessee especially this time of year - you never know what the weather will do. It can be 20 degrees one day and 60 the next! Hope you can come back during warmer weather and really enjoy the view! The views are stellar. The decor is charming. The kitchen was well stocked with all of the pots and pans we needed to make a good dinner. It was easy to find, even in the dark. We'd love to come back to the lake in the summer. Glad you guys enjoyed your visit to Suite Spot! Hope you can come back when the weather is warmer and you can enjoy the lake!! "Suite Spot" is located right down from Indian River Marina. This location is on a fabulous part of the lake. The next marina via water is Whitman Hollow. 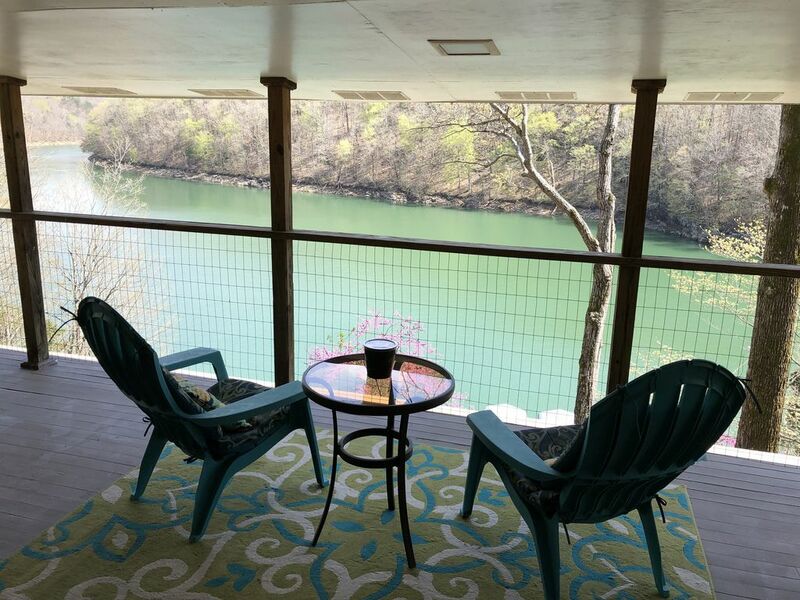 Suite Spot is a great place to venture out onto Norris lake for skiing, tubing, swimming, fishing, or whatever fits the mood!